Location: Anahim Lake, BC, is a popular fly fishing lake located 322 km (199.64 mi) west of Williams Lake on Highway 20 and offers good access from a number of locations along Highway 20. 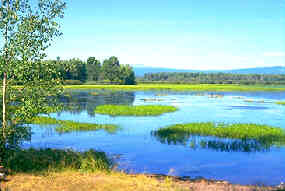 Resorts & Campsites: There is a Forest Service Recreation Site at Little Anahim Lake that provides a rest stop on Highway 20 for canoeing, picnicing and waterfowl observation. 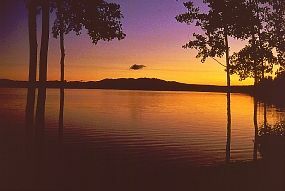 Accommodations, services, camping and facilities are provided by resorts along Anahim Lake as well as the Village of Anahim Lake. Anahim Lake also has the valuable asset of a 975 metre (3198 ft.) paved airstrip. Fishing Report: Anahim Lake reports an average of 14 to 16 inch wild stock rainbow trout reaching up to three pounds. Although spin fishing and trolling are effective, this lake is particularly popular for fly fishing. Fly fishing is very productive in early summer and fall but it is good throughout the season. Where the water flows in from Little Anahim provides the best fly fishing on the lake. A unique fly fishing experience comes when one drifts the river from Anahim to Abuntlet Lake. Viewscape: The view from this popular resort lake is of foothill country covered with a coniferous forest of pine and spruce. This shallow lake is a popular viewing spot for wildfowl. Shoreline: The gravelly shoreline is interspersed with grass, poplar, alder with rushes covering about 80% of the shore.